Raspberry Pi boards, or more specifically the Broadcom system-on-chips they are based upon, have the capability to generate a wide range of stable clock signals entirely in hardware. These are called general-purpose clock peripherals (GPCLK) and the clock signals they generate can be routed to some of the GPIO pins as alternate pin functions. I was recently interested in this particular detail of Raspberry Pi and noticed that there is little publicly accessible information about this functionality. I had to distill a coherent picture from various, sometimes conflicting, sources of information floating around various websites and forums. So, in the hope that it will be useful for someone else, I'm posting my notes on Raspberry Pi GPCLKs with links for anyone that needs to dig deeper. My research was focused on Raspberry Pi Compute Module 3, but it should mostly apply to all Raspberry Pi boards. The root of the tree is an oscillator on the far left of the diagram. BCM2835 derives all other internal clocks from it by multiplying or dividing its frequency. 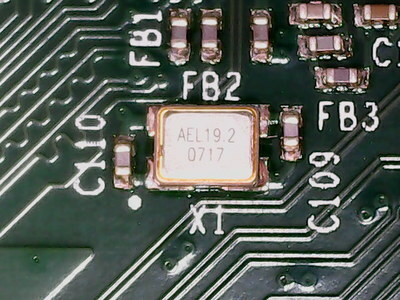 On a Compute Module 3 the oscillator clock is a 19.2 MHz signal defined by the on-board crystal resonator. 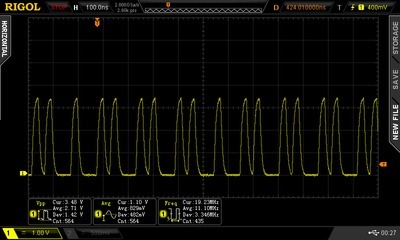 The oscillator frequency is fixed and cannot be changed in software. The oscillator is routed to a number of phase-locked loop (PLL) devices. A PLL is a complex device that allows you to multiply the frequency of a clock by a configurable, rational factor. Practical PLLs necessarily add some amount of jitter into the clock. How much depends on their internal design and is largely independent of the multiplication factor. For BCM2835 some figures can be found in the Compute Module datasheet, under the section Electrical specification. 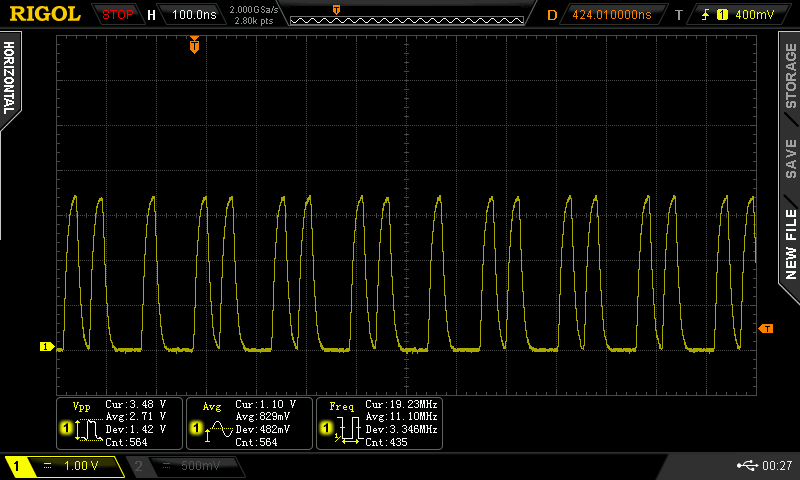 You can see that routing the clock through a PLL increases the jitter by 28 ps. Image by Raspberry Pi (Trading) Ltd. The BCM2835 contains 5 independent PLLs - PLLA, PLLB, PLLC, PLLD and PLLH. The system uses most of these for their own purposes, such as clocking the ARM CPU, the VideoCore GPU, HDMI interface, etc. The PLLs have some default configuration that however cannot be strongly relied upon. Some default frequencies are listed on this page. Note that it says that PLLC settings depend on overclocking settings. My own experiments show that PLLH settings change between firmware versions and whether a monitor is attached to HDMI or not. On some Raspberry Pi boards, other PLLs are used to clock on-board peripherals like Ethernet or Wi-Fi - search for gp_clk in dt-blob.dts. 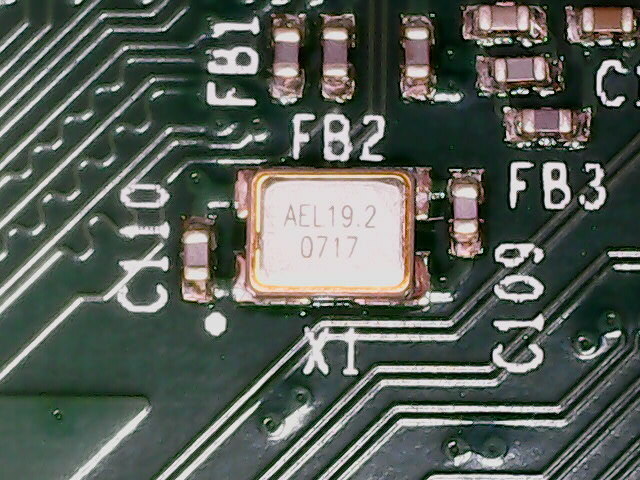 On the Compute Module, PLLA appears to be turned-off by default and free for general-purpose use. This kernel commit suggests that PLLD settings are also stable. For each PLL, the multiplication factors can be set independently in software using registers in I/O memory. To my knowledge these registers are not publicly documented, but the clk-bcm2835.c file in the Linux kernel offers some insight into what settings are available. 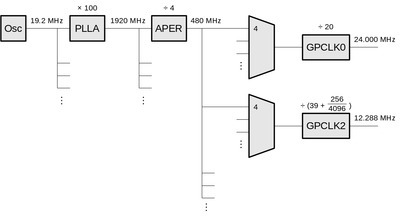 The output of each PLL branches off into several channels. Each channel has a small integer divider that can be used to lower the frequency. 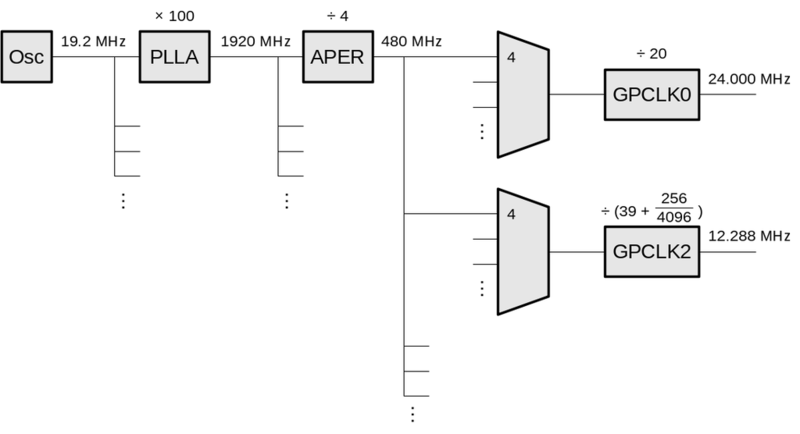 It is best to leave the settings of the PLL and channel dividers to the firmware by using the vco@PLLA and chan@APER sections in dt-blob.bin. This is described in the Raspberry Pi documentation. There are three available GPCLK peripherals: GPCLK0, GPCLK1 and GPCLK2. For each you can independently choose a source. 5 clock sources are available: oscillator clock and 4 channels from 4 PLLs (PLLB isn't selectable). Furthermore, each GPCLK peripheral has a independent fractional divider. This divider can again divide the frequency of the selected clock source by (almost) an arbitrary rational number. A simpler way for taking care of GPCLK settings is again through the dt-blob.bin file. By using the clock@GPCLK0 directives under clock_routing and clock_setup, the necessary register values are calculated and set automatically at boot by the firmware. As far as I can see, these only allow using PLLA and APER. Attempting to set or use other PLL sources has unpredictable results in my experience. I also recommend checking the actual clock output with an oscilloscope, since these automatic settings might not be optimal. It's best to keep your clocks divided by integer ratios, because in that case the dividers introduce minimal jitter. 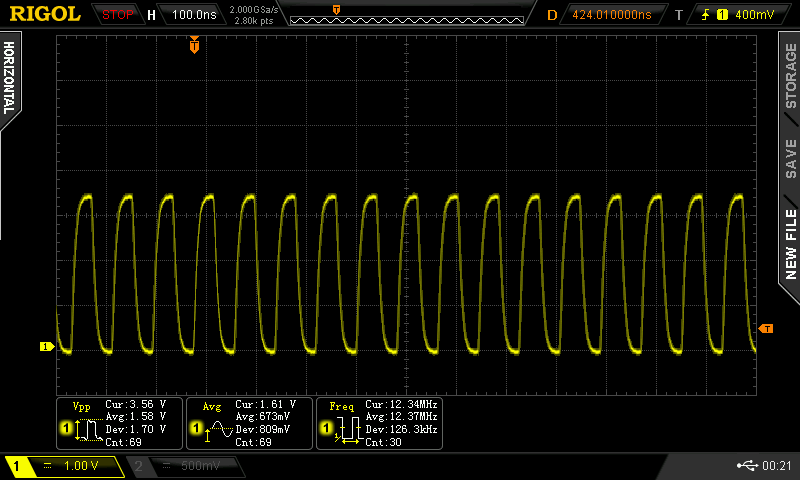 If you can't do that, jitter is minimized by maximizing the input clock source frequency. In my case, I wanted to generate two clocks that didn't have an integer ratio, so I was forced to use the fractional part on at least one divider. I opted to have low jitter, integer divided clock for the 24 MHz USB clock and a higher jitter (but still well within acceptable range) for the 12.288 MHz audio clock. GPCLKs can be useful in lowering the cost of a system, since they can remove the need for separate expensive crystal resonators. However, it can sometimes be deceiving how easy they are to set up on Raspberry Pi. dt-blob.bin offers a convenient way of enabling clocks on boot without any assistance from Linux userland. Unfortunately the exact mechanism on how the firmware sets the registers is not public, hence it's worth double checking its work by understanding what is happening behind the scenes, inspecting the registers and checking the actual clock signal with an oscilloscope. Exellent content! I read your content impressively. I will make a 7-port USB hub (USB2517) circuit that link with GPCLK1 (GPIO 42) 24MHZ clock (Raspberry pi CM3). Based on your posts,to create a 24MHz (GPCLK1 - GPIO42) clock, I modified and compiled dt-blob.bin, but it failed to work. How to add "clock_routing" and "clock_setup" to the example dt-blob.bin file? Can you publish the finally modified dt-blog.bin file? Yay, that works perfectly for me, You're a star. How many truth values are there in ternary logic?